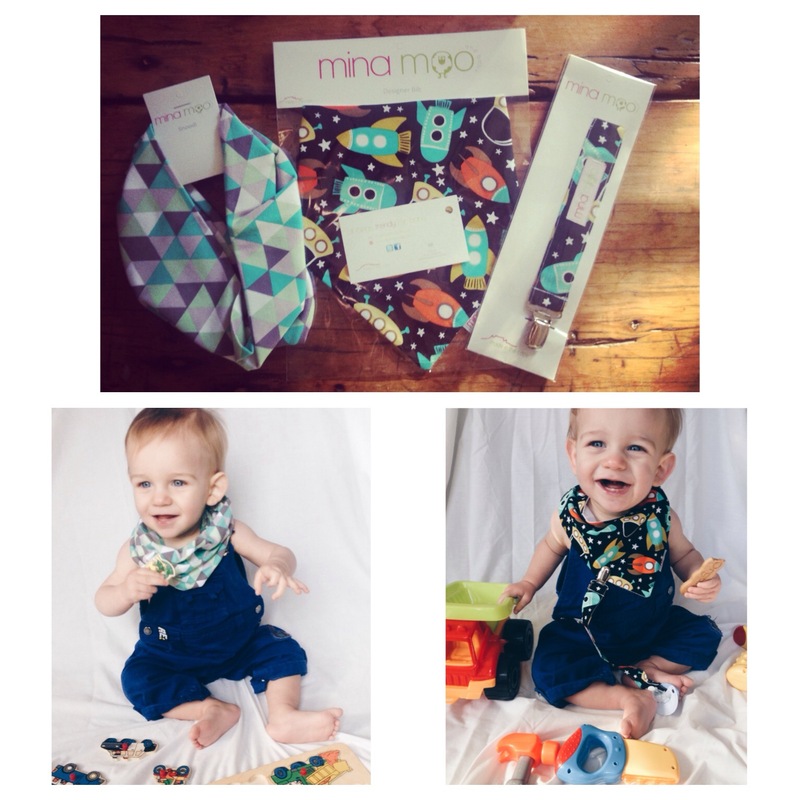 I eagerly awaited the arrival of the garments I was so generously given to review from Mina Moo and Baby. Two days later it arrived on my doorstep beautifully packaged. I couldn’t wait to rip it open to see what was inside! I was able to choose the designs I wanted for the Snoodi, Dribble bib and a Dummy clip for my 10 month old son. I must admit, I have never been an indecisive person, but I genuinely was so in love with all of them, it wasn’t an easy decision! Mina Moo Baby doesn’t have a large range of designs to choose from – but they had just enough not to leave my brain in a ramble! There is something for every little girl or boy. I tore open the packaging, and was immediately drawn to the phenomenal quality of the products. I sat there feeling it for ages. I was even tempted to wake my son up from his nap to try it all on him! The products are practical and a necessity for a baby. The Snoodi is my new favourite MUST have for my little one. With his neck exposed in this icy wind – I can’t think of anything more genius! Mina Moo Baby has extremely trendy designs which I love. I have never believed in dressing my kid older than what he is – but I find that a lot of clothing available at the local stores are extremely babyish (which don’t get me wrong, is cute too!) and I have fun dressing him up as a little dude with style. However, they have something for everyone. I chose the Retro spaceships dribble bib and the matching dummy clip, and the Geometrical print snoodi. These products would make an amazing baby shower gift! I plan to spoil my friends who are Momma’s-to-be with some Mina Moo and Baby products in the future! I can highly recommend them! I love that these must have items are affordable! It isn’t often that you find something of such great quality that doesn’t break the bank anymore. I have always avoided common stores for myself, because I don’t enjoy walking past someone wearing the same clothing or accessories as me. So, I really like that my son isn’t wearing what hundreds of other babies are wearing! Mina Moo and Baby products are made from 100% cotton. If your baby is anything like mine when teething – you need a cupboard full of bibs. I have to wash them on a daily basis and sadly, many of them fade and get destroyed. At least this way I know, no matter how many times they need to be washed – the quality will remain the same! The Dummy Clip is an essential in my household. I used to spend ages hunting down my sons dummies at once a day. This way, at night you can easily find them in their cot, or when your little one is fussing it can’t go far. I don’t know about you – but in the first 2 months (before I discovered dummy clips) I lost two dummies when we were at the mall! This way they can’t get lost overboard, and it is also more hygienic as they don’t get dropped on the floor all day long. This may even save you your sanity as it has for me! I love to support local businesses! Especially Moms who have done such a phenomenal job in making an income for their families! Mina Moo Baby has an online shopping option on their website: http://www.minamoobaby.com where they do shipping and delivery. This means that if you live overseas, this product is for you, too! The website is easy to use, stylish and an absolute pleasure to browse around. Yasmina, the genius behind the brand is just divine to deal with. I wish I could give her a huge hug and congratulate her on such a fresh take on baby products. I am officially obsessed! Thank you, Mina Moo and Baby for restoring my faith in the future of my sons fashion sense.